Following significant activity in 2013/4, all might appear to have gone quiet on expanding the role of natural gas in the UK’s bus fleets. At Coach and Bus Live 2015, the Gas Bus Alliance was actively promoting the concept although there were no gas buses or associated infrastructure prominently displayed. It should be noted, however, that both manufacturers that have recently supplied gas powered vehicles to the UK, Scania and MAN, chose not to exhibit at the event. The potential for gas was given more emphasis at Busworld Kortrijk with vehicles from a number of manufacturers aimed at a variety of market segments. 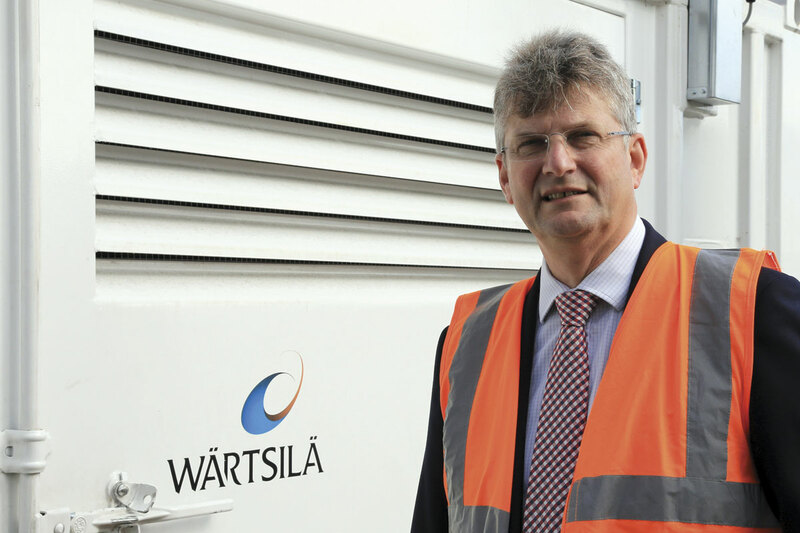 Peter Crowe, Sales Manager, Compression Business, Wärtsilä. To find out more about the benefits and challenges associated with switching to natural gas, David Cole recently met up with Peter Crowe, Sales Manager, Compression Business for the UK operations of Wärtsilä, the Finnish marine and energy corporation which supplies gas compression, storage and fuelling facilities. The meeting was hosted at Reading Buses headquarters by the latter’s Chief Engineer, John Bickerton, providing the opportunity to view an operational Wärtsilä installation and also hear more of Reading’s operational experience with a fleet of 34 gas powered Scania vehicles. In the UK. gas powered vehicles run on compressed natural gas (CNG) normally delivered from the country wide gas pipeline and distribution system network and stored in high pressure cylinders on the vehicle. Natural gas is principally methane, naturally occurring under the North Sea and elsewhere but also derived from organic materials. The biomethane from the latter is normally processed to make it compatible with the natural gas in the UK network in terms of calorific value, burning characteristics and moisture content enabling it to be injected into the network. Within the UK, buses powered by gas produced from coal helped reduce the UK’s dependence on imported fuels during the two major conflicts in the first half of the twentieth century. Low pressure gas storage required large balloon like additions to the vehicles involved and gave a limited range. To avoid the need for storage, small scale mobile gas works for towing behind vehicles were developed in the 1940s. These producer gas trailers provided a relatively poor quality gas leading to sluggish performance from converted petrol engines. The use of gas was rapidly discontinued as soon as liquid fuel supplies improved. Although natural gas, introduced to the UK in the 1960s, had established itself quickly as a vehicle fuel in some European countries, it was to be the 1990s before the first natural gas bus fleets were introduced in the UK. Volvo supplied the majority of vehicles although there were instances of Dennis Darts and Mercedes-Benz midibuses being built or converted to use the fuel. Whilst seen as pioneering, the operations met with limited success due to several factors including the fuel tax regime (fuel duty rebate on liquid fuels), converted rather than dedicated gas engines and variable gas quality from the ageing low pressure gas infrastructure. Increased emphasis on environmental performance together with Green Bus funding and the move to BSOG brought renewed interest in natural gas as a fuel. Across Europe, development of vehicles and infrastructure had continued, delivering very low emission buses, dedicated gas engines and clean dry gas at the point of fuelling. A collective of suppliers established the Gas Bus Alliance in 2009 to promote natural gas buses and dedicated vehicles were announced by MAN and Scania, the latter in conjunction with ADL. The Alliance supported a series of demonstrations to operators using its mobile fuelling stations. Between 2012 and 2014, over one hundred MAN and Scania natural gas buses were introduced at five locations; Reading Buses, Sunderland (Stagecoach), Runcorn and Darlington (Arriva) and Beccles (Go-Ahead). In addition, a small number of Optare Solos were converted to gas power for Go-Ahead and Stagecoach, the latter for a now terminated project in Lincoln. Wärtsilä have been involved with CNG projects since the late 1980s and have supplied a large proportion of the CNG stations currently operating in the UK, including four of the five current bus depot installations. The Finnish corporation has a worldwide presence in the marine and oil and gas industries. Reading Buses gas station occupies a significant corner of the depot yard. A fire wall separates it from adjacent premises. A typical natural gas vehicle fuelling installation consists of a metered offtake from the gas network, compression, drying, high pressure storage and dispensers. Once installed, systems are scalable through the addition of further high pressure storage and longer compressor running times to support additional dispensers or through use by third parties outside of the normal fuelling window for the bus operator. With each vehicle requiring around 100kg of gas per day, the minimum viable fleet size for a fuelling installation is around 10 vehicles although Wärtsilä are working on smaller and lower cost options. Installations can be purchased, rented or operated on a pay through the nozzle basis calculated on throughput. The development of lower cost fuelling packages is just one of the opportunities supporting growth in the use of natural gas buses. In England and Wales, operators were given the opportunity to bid for grants from the £30m Low Emission Bus Scheme offered by the Government’s Office for Low Emission vehicles. Successful applicants for the fund for which bids closed at the end of October will receive up to 90% of the cost difference of the vehicle versus a diesel equivalent and up to 75% of infrastructure costs. New sources of gas provide opportunities to increase the industry’s green credentials. Waste digestion plants are a significant growth area with biomethane now produced from animal slurry, food waste or human waste. The bio-bus pilot project in the Bristol area using the latter has raised awareness through its graphics, giving it the title of the ‘Poo Bus’. A process has also been developed to deliver biomethane from residual non recyclable waste. With an £11m government grant, Advanced Plasma Power is to build a full size pilot plant using its Gasplasma® technology in Swindon. The plant is quoted as being ‘sufficient to fuel all the buses in the town’ but will initially be used by heavy goods vehicles. There are, however, logistical challenges to the installation of the required gas infrastructure. Timescales for securing both planning approval and a connection to the national gas network can be extended, especially if the network operator needs to install additional system capacity to ensure adequate pressures under operational conditions. Another key challenge is finding sufficient space within a depot for the equipment’s footprint although roof mounting may be an option for the future. The need for gas compression and drying can be significantly reduced if the connection can be made to a higher pressure tier of the gas network so a range of location and connection options should be considered to deliver an optimum solution. 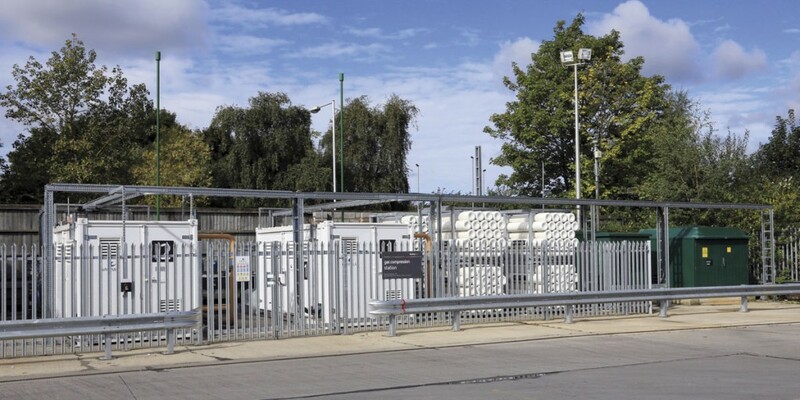 Another option is the use of one of the growing number of commercially operated CNG fuelling stations being installed close to the main UK road network, primarily in support of the fleets of gas powered heavy goods vehicles being introduced by a number of logistics companies. 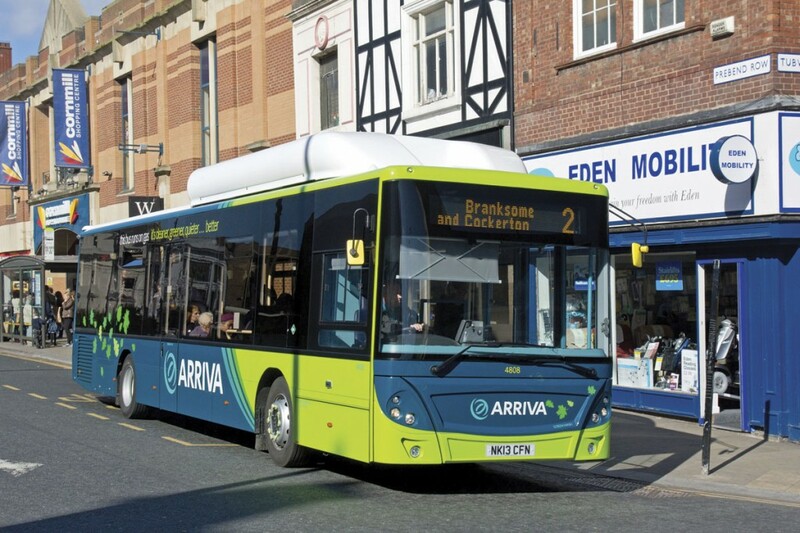 Reading Buses’ initial venture into gas power was based around a Green Bus funded project to operate Reading Borough Council’s Greenwave route network. A second phase was promoted commercially to increase the gas bus fleet up to the maximum requirement for standard single deck vehicles in the town. The project was authorised before Chief Engineer, John Bickerton and CEO, Martijn Gilbert joined the company and both have become firm converts to the benefits of gas power. MAN supplied the first vehicles to enter service following the renewal of interest in gas buses. Arriva operate them in Runcorn and, as seen here, Darlington. John provided an insight into the reliability of the 34 strong fleet of ADL bodied Scanias which showed their failure rates to be significantly below other vehicle types. His statistics showed that intensive attention to failure modes of a particular type could move its performance closer to that of the gas vehicles but noted that such a programme could also further improve the gas vehicles’ performance in the future. This reliability adds a further benefit to those of lower operating costs, simpler maintenance and quieter operation that characterise gas powered vehicles. Core to Reading Buses’ requirements for the adoption of gas vehicles was the need for the vehicles to be integrated into the normal daily run in programme, the time frame for which was dictated by the wash time. Vehicles therefore required fuelling in a similar time to a diesel bus. Wärtsilä’s solution has gas dispensers on each of the three fuelling islands in Reading Buses’ depot. They are fed from high pressure storage cylinder banks which are held at three pressure levels to optimise the fuelling process. 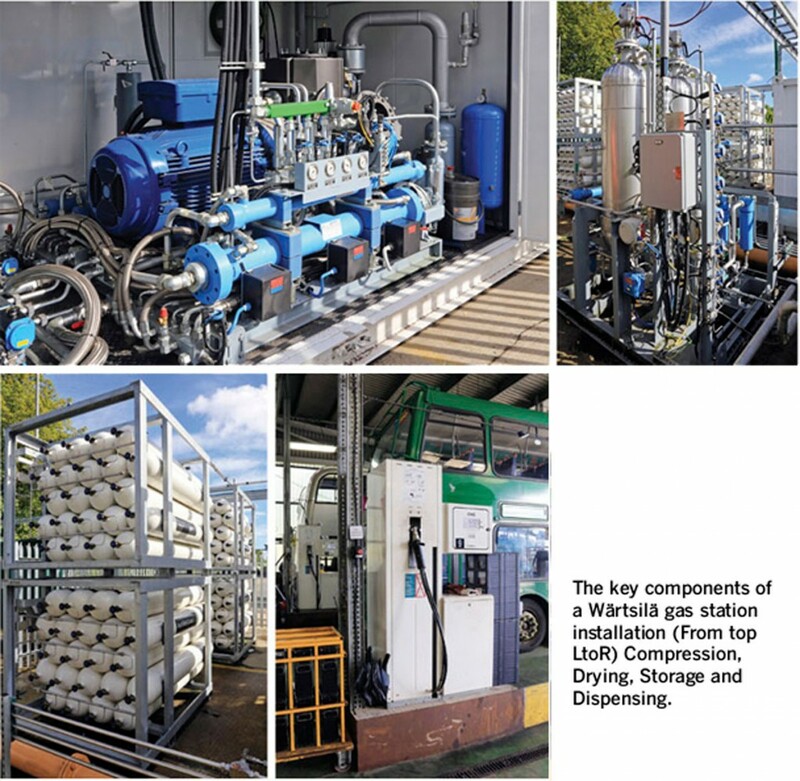 Duplicate four stage compressors and state of the art gas driers installed in the gas station compound ensure continuous availability and compress gas from the local network to around 250bar with no moisture content at point of use. Reading Buses’ gas station, commissioned early in 2014 and formally unveiled in the following September has proved extremely reliable in operation. It was described in detail in B&CB 1293 (12 September 2014). The company has been at the forefront of promoting gas buses including staging a high profile ‘fastest bus in the world’ event where one of the Scania vehicles achieved a maximum speed of 80.73 mph on the Millbrook circuit. The latest Euro6 natural gas powered buses achieve environmental standards without the complexity of hybrid power trains, the range restrictions of electric vehicles or the need for exhaust gas treatment additives. They have the opportunity to achieve more with developments such as hybrid, microhybrid or range extender systems and to offer more scope to operators with the availability of double-deck gas vehicles. Reading Buses expect to trial the first of the latter in the UK early in 2016 although a number of Neoplan examples have been operating successfully in the German city of Gotha. 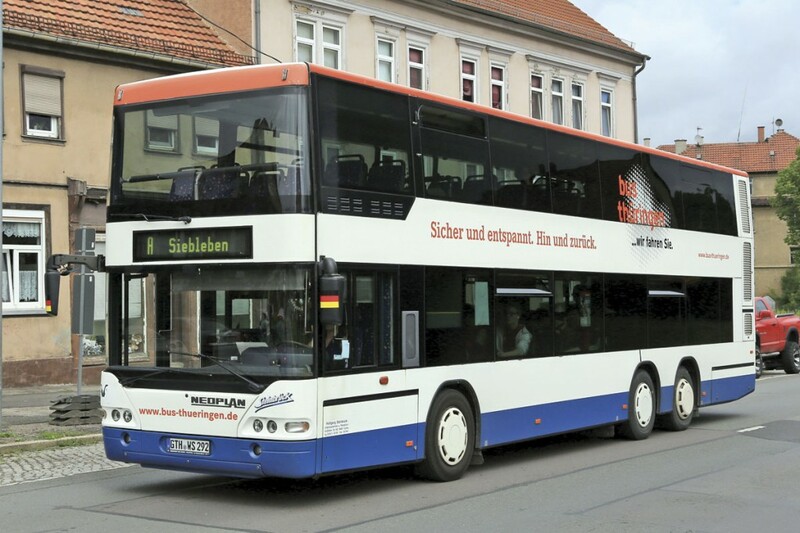 A small number of gas powered Neoplan double-deckers have been operating successfully in the German city of Gotha. Note the ventilation louvres for the gas storage at the rear of the upper deck. Whilst gas buses may not provide zero emissions at point of use, their overall environmental impact from well/source to wheel is significantly lower than other fuels, even more so when the gas used is balanced by an equivalent amount of biomethane being introduced to the gas network. The latter raises the reduction of CO2 to atmosphere compared to a Euro6 diesel from 10% to approaching 90%. With no exhaust gas treatment, they are less complex to maintain and the efficient combustion process is quieter, which gives a quieter environment for passengers. The economics add up too! Operators across Europe remain committed to gas power and confidence in the fuels’ future was evident at Busworld Kortrijk. There, Mercedes-Benz formally launched the gas powered version of the Citaro and the first example of Scania Interlink to be unveiled featured gas power. Scania gas power also featured in an interurban bus from Castrosua and in Scania’s own Citywide optimised for the use of biomethane at source. In addition to a gas powered Daily minibus, Iveco had a gas powered Urbanway available for demonstration and revealed that over half the model’s production so far in 2015, around 450 vehicles, featured gas power. Surprisingly perhaps, MAN did not show a gas vehicle although their gas powered Lions City articulated bus had received the acclaim Bus of the Year 2015 at the IAA in 2014. Solbus from Poland presented a CNG electric hybrid in addition to their LNG (liquefied natural gas) option. 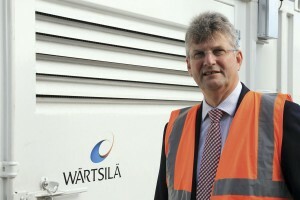 Further details of solutions from Wärtsilä can be found at www.wartsila.com and the Gas Bus Alliance can be contacted on 02920 448118.